Grab yourself a lederhosen, some friends, and prepare for Oktoberfest 2016 with münchen TV! Oktoberfest 2016 is just around the corner and münchen.tv will be there to cover the whole thing. Oktoberfest (in Japanese „オクトーバーフェスト“) is a 16-day festival held in Munich, Germany that celebrates the city of Munich and the wedding of Prince Ludwig and Princess Therese in 1810. It takes place on the last two weekends of September and ends on the first Sunday of October. Over 6 million people from all over the world visit this festival each year. This makes Oktoberfest the largest fair in the world. The festival has not always been known as Oktoberfest or known for its beer. It actually started as a celebration of the marriage of Prince Ludwig and Princess Therese of Saxony-Hildburghausen on October 12, 1810. Festivities were held on the fields in front of the city gate where the citizens of Munich were invited to take part. The fields then became known as Theresienwiese, or “Theresa’s meadow.” The locals of Munich started calling them “Wies’n” for short. As a gift to the newlyweds, a horse race was organized. Because of the huge success, the royal family decided that the horse race should be repeated every year. With this, the tradition of the „October-Festival“ was born. Today those races are not part of the yearly fair anymore. However, every four years an Agricultural Show, which was developed from those horse races, takes place at the same time as the main Oktoberfest. Oktoberfest did not always have the giant entertainment aspect it has today. The first rides (a carousel and two swings) and small beer stands did not exist until 1818. The beer stands grew over the years and in 1896 they were replaced by beer tents that are sponsored by different breweries. There are a total of 14 giant tents and 20 small tents. The giant tents have a seating capacity of 100,000. One individual tent, owned by Hofbräu München, can seat nearly 7,000 inside alone. The rides in the festival include traditional and modern rides, such as a Ferris wheel, toboggan, and the Olympia looping. The festival eventually became the event it is today with food, beer, rides, music, and much more. Already under construction in June, the 14 large and 20 small, beer tents will remain in place until their deconstruction after October 4th. 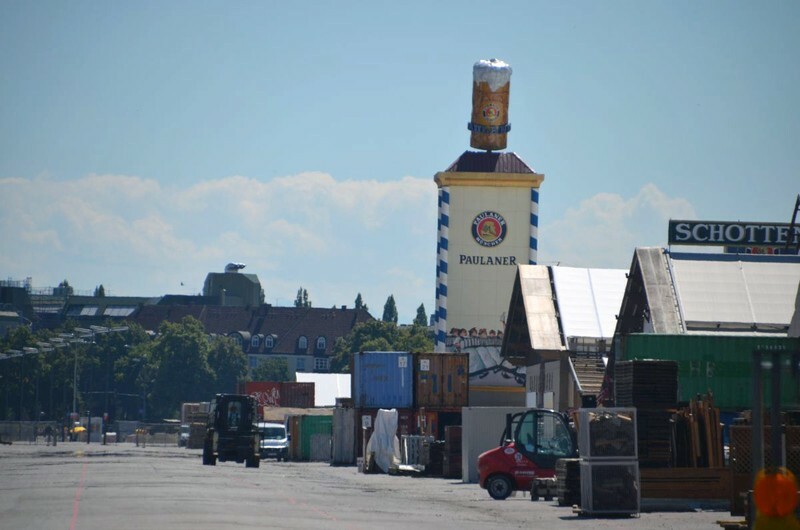 Here, under sweeping fabric and warm light, beers from breweries such as Löwenbräu-Festzelt and Augustiner-Festhalle will be sold in the iconic “Maß,” the large one liter stone or glass mugs. This year one “Maß” will cost at least 10€, with the cheapest from Vinzenz-Murr-Metzgerstubn for a flat 10.00€. Finding seating in one of the in-demand tents may be a problem, especially in the afternoon hours. But disappointment can be avoided by making reservations for specific tents through the individual tents themselves. Prices for these may run up to 60€ for smaller tents and even more for larger tents and the “Weinzelt” or Wine tent. On weekdays those tents are open from 10:00AM to 10:30PM, on weekends and holidays from 9:00AM to 10:30PM. The festival remains family friendly as well, with many attractions such as bumper cars, fair games and reduced rates on Family Tuesdays (September 22nd and 29th). However, age considerations for children must still be considered. Those under 8 are not allowed in the tents late at night, those under 16 may not have strong alcohol and prams are no longer allowed past 6PM. With such a big presence in Munich, Oktoberfest is heavily covered by all kinds of media. münchen.tv is the most well-known and most popular media coverage of the Oktoberfest festivities. münchen.tv streams live reports of the festivities from 6 pm to 9 pm every day. 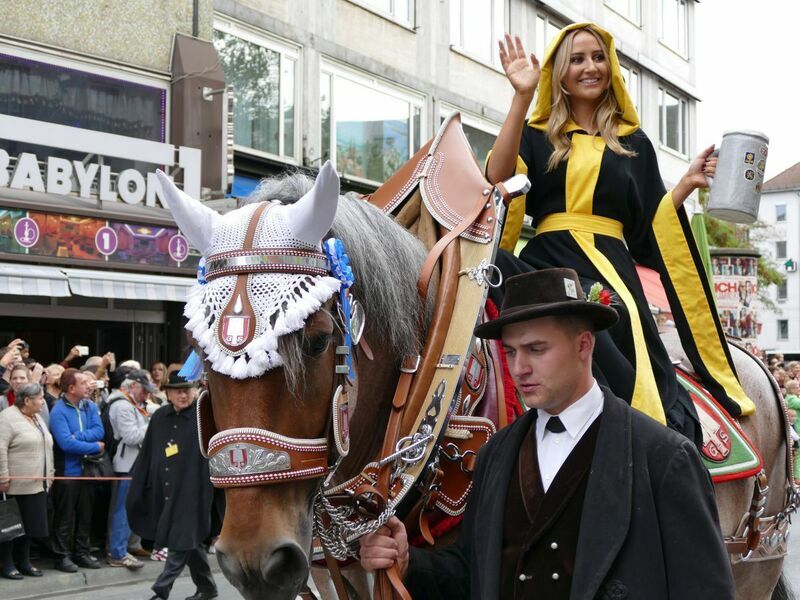 Marion Schieder and Alex Onken are the münchen.tv Oktoberfest stars – they are famous for their show. They usually interview many different important personalities such as the mayor of Munich, athletes, visitors from all over the world, and many other VIP’s. münchen.tv will also be reporting on the tradition of Oktoberfest. The many different rides available at the festival will be covered as well. If it’s at the Oktoberfest, then münchen.tv will have coverage on it.